The concept of this book was tantalizing to me; a British ship of the line encounters a French frigate during the Napoleonic Wars, in unspecified Asian waters. Quickly defeating the French, the captain of the HMS Reliant seizes his prize: the frigate and all it contains... including a mysterious, enormous egg. The book gallops through the identification and hatching of the dragon therein, a piece of the story I would have rather spent more time with. The author's rush to the training of a battle dragon and the action of war is not unmerited, however, as the military scenes are well written and moving. 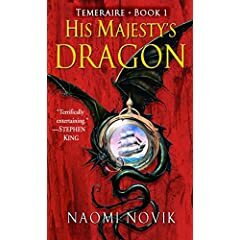 My only disappointment was one of misplaced expectation; I was hoping to read a piece of historical fiction, with a perspective on the Napoleonic conflicts enlightened by the improbable addition of a solitary oriental dragon. Instead, the book is diversely populated by a cast of dragons and humans, and their interactions are the main coverage of the work. My favorite parts, on reflection, had to do with the character Levitas; kudos to the author for writing the more difficult outcome instead of an easy chatter about redemption and forgiveness, such as might be found in any syndicated TV program. Also noteworthy is the publisher's scheme to produce all of the series at once, rather than staggering the series out over years as is more often the norm. This is a recommended read, though I'm not sure that I'll read the sequels.